Our auction tonight is at a place called "The Island". I have never been here before and never really heard of it, but as far as I can figure it is a indoor and outdoor sand volleyball facility. Apparently they also rent out the space for events. We are here to do a silent auction for Southmoore Elementary school. Thank goodness it is indoor because it there is a possibility of snow tonight. But, we are setting up a computer network on SAND. It is very dusty sand. This is not a good place for us to do an auction. It is hard to setup and the dust is not good for our equipment. But, we aim to please, so our corporate policy is to not complain too much about it. And come to think of it, this is not the worst venue we have done one of these in. The worst, actually is the Polo Classic (http://www.denverpolo.org/) because it is always over the hottest weekend of the year. I don't know how the 20/30 club of Denver manages it, but somehow they are always able to get it scheduled that way. Sometimes they even throw in huge thunderstorms just to keep us on our toes. Thunderstorms are not good for computer equipment either. the Polo Classic is even the one we do for free. We're so smart. Anyway, we are pretty much setup for our even now. It does not start for about 2 hours, so I guess the setup was not too bad. It is so much nicer now that we have paid setup people. I've been playing around watching Slingbox the past couple of events. It works ok, but I am a bit disappointed with the quality of the picture while using my phone as a modem, but it is better than missing the Avs or the Nuggets. Plus, it is one of those guy toys I can show off with. I just noticed that the Nuggets are on a big TV in the bar of this place while I was watching a little choppy picture on my computer. Oh well. Well... it is now the next day. We survived the night. The equipment seems to have survived. It was actually sort of fun. It was a late night. We go to Tommyknockers quite a bit. I'm actually the only one who likes the beer. Well, Tracy does claim to like some girly fruity beer that they make, but I sort of doubt ANYONE actually likes fruity beer. Maybe. But I doubt it. We took off today for a mountain adventure. I have never been up the Central City Parkway and figured there must be somthing somewhat interesting in the Central City / Blackhawk area. I was wrong. We did find a somewhat cool park in Blackhawk, but Tyler fell making it not quite as cool. For the most part, the day trip was a failure. 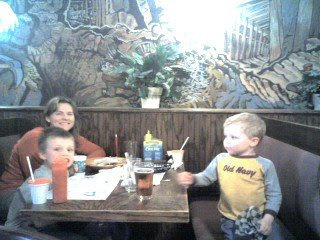 But, we headed back to Idaho Springs and Tommyknockers brew pub made the whole trip worth it. This past Sunday we went to Chatfield State Park for a picnic. After lunch, Tyler rode his bike around. My laptop was running out of space, so I got myself a 250 GB portal external drive. When I first connected it, XP assigned F: as the drive letter. So, google came to the rescue and I found the following way to set the drive letter of an external drive. It worked fine for me. Cool Beans. 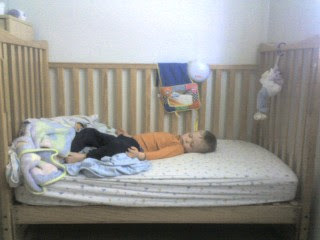 Here is a picture of my 3 year old boy napping in his "new" big boy bed. He made the "move" this past Sunday and was very excited about being able to sleep in a bed like Tyler's. Of course it is the same bed. The only difference is that I removed one side so that he is no longer contained. My wife was nervous, just like she was for Tyler when he got out of the crib, that Connor would abuse his new-found freedom and we would spend all kinds of time trying to get him back in bed. Just as was the case with Tyler, though, he stays there until morning. So far. At least this time we did not get a stupid side rail to keep him in bed. Tracy listened to me this time on that. This is quite a milestone as it is the first thing she has listened to me on since we became parents, possibily even since we got married or maybe even engaged. That is probably not true. I am sure she has listened before; I just cannot think of a time. So anyway, Connor is thrilled to be a big boy. Even his big brother is excited about Connor's big step. Tyler and Connor have been begging for permission to have a "sleepover" in Conor's room. Tyler had his sleeping bag set up all week so that should the parents agree, he would be ready. I finally gave in last night, and they had a great time. They were up earlier than I would have prefered but for the most part it was not even a problem for Mom and Dad. Connor will be 3 tomorrow, but he is still our baby. And he is definantly less grown up than Tyler was at 3. He is liking that he gets to have a birthday and he appears to be more excited about the accomplishment of growing up even more than for cake icecream and gifts. Our baby is so cute.